Actress Priyanka Chopra Jonas shared how her relationship with husband Nick Jonas evolved after their "quick" marriage. On "The View" Tuesday, the 36 year-old newlywed – who was single last time she was on the show – discussed life with the 26-year-old Disney alum and the Jonas family. They first met one another at the 2017 Met Gala. Although they reportedly didn't start dating until the following year, they were engaged in July through a roka ceremony in Mumbai. After Jonas proposed, Chopra was forthright about her shortcomings in the kitchen, she told "The View" co-hosts. 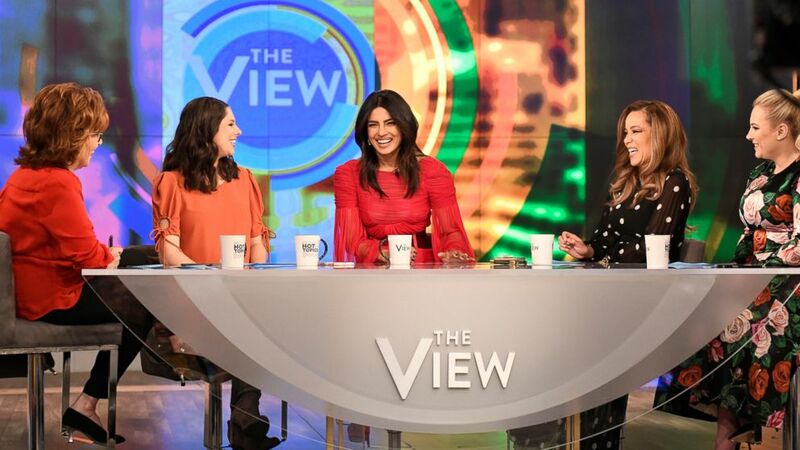 Priyanka Chopra discusses her marriage to Nick Jonas with "The View" co-hosts Abby Huntsman, Joy Behar, Sunny Hostin, and Meghan McCain, March 19, 2019. "I can't cook. I told him that when he proposed. I was like, 'Listen, you're from a good southern home you're used to your Mom making you amazing food ... you're not marrying that girl.'" "I can make eggs," she continued. "I'm better at making eggs at night for dinner because I'm awake at that time. I'm a terrible, terrible wife in that sense." Chopra revealed that "the most amazing thing" that happened after she told her then-fiancé that she doesn't cook was his response. "He said, 'It's alright babe. Neither can I.'" "You don't hear that from guys!" she said. The couple officially exchanged their "I dos" twice while in Jodhpur, India. Their first wedding was a Western ceremony on Dec. 1 at the Umaid Bhawan Palace. They wed again in a traditional Hindu ceremony the next day. "It's so different after and before marriage" Chopra said. "Marriage feels so different. It's like the family you choose." Chopra's husband and brother-in-laws, Kevin and Joe, recently reunited their band, The Jonas Brothers. Their new song, "Sucker," debuted with a music video that featured Chopra, her sister-in-law – Kevin's wife – Danielle Jonas, and actress Sophie Turner, who's engaged to Joe. With over 75 million views on YouTube, the idea for "Sucker" came about during a dinner conversation with the family. "We were talking about video girls and who should be in the video and everything, and the boys looked round the table and looked at us, and we looked at each other and were like, 'Oh yeah. That makes sense... look at who we're married to!'" According to Chopra, the video was shot over two days in London in a castle where they were surrounded by $200 million worth of art. "To do it with your family was really great," she said.